I wish you great fortune with your two series. I’m curious why you decided to do a second series when a first seems to be going well. What’s the mortality of Berkley’s 3-book series after the first three books? Thanks for the welcome, Jim & Elaine. I started a second series because I'm getting a late start -- and I want a career! Many of the more successful writers on the lighter side write multiple series: Rhys Bowen, Laura Childs, Carolyn Hart, Sheila Connolly, and others. Many don't, of course, but I couldn't tell all the stories in my head any other way. No clear answer to your second question. I'm looking at my shelves and seeing several series from Berkley and its sister company NAL that are well over ten books: Cleo Coyle's Coffeehouse Mysteries, Laura Childs' Tea Shop and Scrapbooking series, and a few that didn't find their audience. What I admire about these publishers is that they rarely simply drop a writer; if the first series doesn't fly, they ask her for another proposal. Oh, I should have clarified that Berkley bought the Seattle series months before the Village series debuted -- so we didn't yet know how it would do. And *I* didn't realize how much work the launch would be! Thanks for coming on WWK to share your ideas and advice. I enjoy your work. Keep writing. Welcome to Writers Who Kill, Leslie. I've added your book to my list of books to order. It sounds like one I would like. I like reading and writing cozies because of the community of characters one gets to know and love - or not. And yes, the mystery, too, of who might have done the dastardly deed. It's fun trying to solve that before the end of the book. I'm looking forward to reading CRIME RIB maybe as a summer beach read! I also have a copy of Leslie's nonfiction on my reference shelf. It comes in handy. Thanks for the interview, Leslie. I always read authors works before I interview them. Yours have been a pleasure. Thanks, Warren, Gloria, and EB. Yes -- in cozy world, it's all about the community. Can't wait to start reading your series - such an appealing setting and I love the little mystery of the three star tattoo! Thank you for stopping by. Congrats on your success with Berkley. You helped pave the way. I love the puns in your back cover copy. Did you write it? Thanks, Shari & Diane. (Grabbing book to read back cover copy.) Nope, credit that to Berkley's fabbo copy department, although I did give them ideas. So many wonderful Guppies -- members of the Sisters in Crime Great UnPublished chapter -- paved the way for me at Berkley, especially Peg Cochran, Daryl Wood Gerber, and Krista Davis. 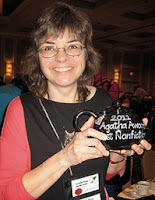 Leslie, I enjoyed meeting you at Malice Domestic. Congratulations on your success. I'm looking forward to reading your book. Congratulations on your success with Berkley, Leslie. I look forward to reading CRIME RIB. After reading your great blurb I want to find out whodunit and why. Thanks, Paula and Kara! CRIME RIB is Book Two -- DEATH AL DENTE is out now! Thanks, EB and Friends, for inviting me to visit with you today!